White Widow x Big Bud from Female Seeds is a feminised cannabis strain which is enormously popular thanks to her crossing. This powerful cannabis strain contains mainly Indica and it is not recommended for the starting smoker. Female Seeds White Widow x Big Bud cannabis plants are suitable for an indoor grow, but they flower very well outdoor as well. This cannabis strain is pretty easy to grow, so she is very popular for the starting grower. She produces big, full buds and this strain produces a good yield. The taste of smoking this cannabis is spicy and skunky. 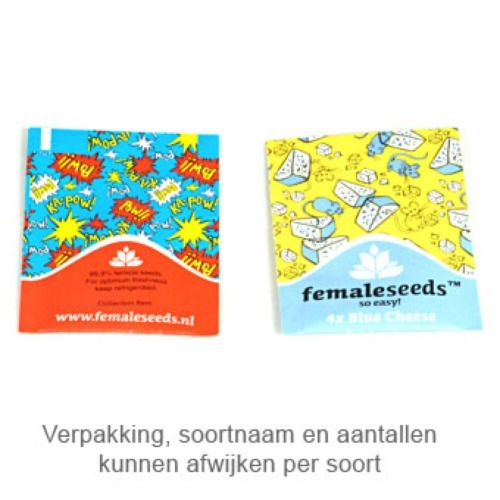 Growing cannabis out of these feminised weedseeds provide you a beautiful plant with great force. Tell us and our customers what you think of the White Widow x Big Bud from Female Seeds.